The Fremont food waste-to-energy plant, located in Fremont, Michigan, touted as the first of its kind in the nation has closed a little more than two years after it opened because it hadn’t paid its electric bill. The plant, operated by Novi Energy, agreed to sell renewable energy — enough to power 1,200 homes — to Consumers Energy. But on Monday, a Consumers Energy crew was at the vacant plant to shut off the power. The plant manager claims it is a legal fight over ownership that led to the shutdown in January but nearby businesses say nobody has been seen working at the plant since late last year. Fences were locked and the lawn was choked with weeds. The $22 million Fremont Community Anaerobic Digester, built with help from a $12.8 million U.S. Department of Agriculture loan guarantee, was designed to take in 100,000 tons of waste each year from West Michigan food processors, most notably nearby baby food producer Gerber Products Co., and turn that into energy. The Fremont project also benefited from a 2008 state law that requires Michigan utility companies to obtain at least 10% of their power from renewable sources in the state by 2015. Anaerobic digestion has been around for centuries, although only recently evolved to where it can produce energy on a utility-use scale from a variety of food waste. The plant is not the first anaerobic digester power site in Michigan, but is considered the largest and the only one in the state that can harness energy from waste sources other than manure. While there is opportunity for more of these plants in the United States, the price of digester electricity is considerably higher than conventional energy. Government incentives would be key. The City of Fremont is keeping a close eye on what’s happening at the plant, since it helped it out with a $120,000-per-year tax abatement and was relying on helping the state make progress on their sustainability goals. This entry was posted in Technology and the Environment and tagged Anaerobic Digestion, BioHitech America, Food Waste, Fremont Community Digester, Waste-to-Energy on May 19, 2015 by Lisa Giovannielli. In 1989 the EPA issued an Agenda for Action that first included the idea of an Integrated Waste Management Hierarchy, which took on many variations before reaching the common one today. The EPA’s basic idea was to attempt to suggest–but not mandate–that, even though landfilling was most common in the marketplace because it appeared cheapest, other options to handle discarded materials were preferable. These included source reduction, recycling, and even waste-to-energy. 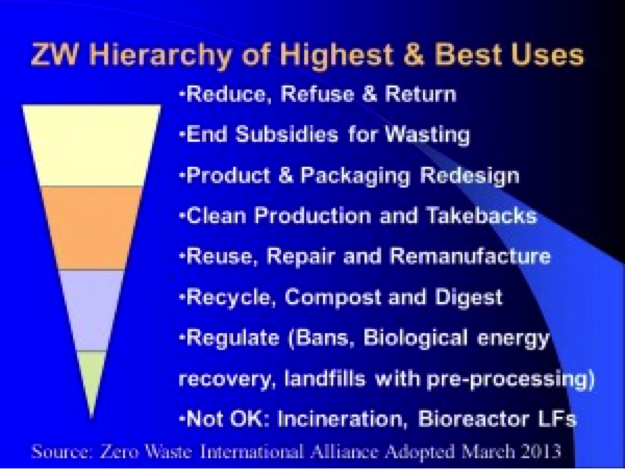 Most recently, Zero Waste International Alliance (ZWIA), a global zero waste organization has upended traditional concepts about the Integrated Waste Management Hierarchy taking that thought further to fully reflect today’s principles of sustainability. And now with state and city policies mandating the diversion of recyclable materials from landfill coupled with the technological advances the waste industry is seeing to not only eliminate the waste more efficiently but to capture the data about the composition of that discarded waste, the hierarchy will likely need to be refreshed often. This entry was posted in Technology and the Environment and tagged BioHitech America, Eco-Safe Digester, Waste Hierarchy on May 8, 2015 by Lisa Giovannielli.